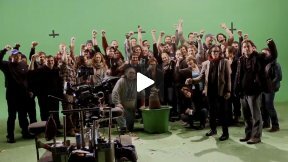 In this behind the scenes video from Abel Ferrara's 4:44, we watch the crew set up a green screen for the next take. Patrick Doherty, the Dolly grip for 4:44 discusses the last couple days of shooting, with big S turns, booms and more.A friend of Dafoe, tells us her thoughts on the upcoming movie and is excited to see the finished of work of a talented team. 4:44 is a new film by acclaimed director Abel Ferrara, starring Willem Dafoe and Shanyn Leigh. The film focuses on the relationship between Cisco (Dafoe), a successful actor, and his painter girlfriend, Skye (Leigh), as the world is coming perilously close to its final moments of existence. Abel Ferrara's 4:44 - Setting Up Green Screen by bitLanders is licensed under a Creative Commons Attribution 3.0 License.